« Lizard Lab launches new Behaviour and Cognition Centre! Lizards learn from their elders too! Social learning—the ability of an animal or human to acquire information by learning from the actions of others is a short-cut to solving many of life’s problems or simply acquiring information more quickly. Just think back to when you got your first video recorder all those years ago, or satellite TV, with a remote with more functions than a space shuttle. Who wants to spend hours poring over an instructional manual when an older person can show you what you need to know in a matter of a few minutes? That way you can get to watching and recording your favourite programs in no time. Social learning was always thought to be the hallmark of highly intelligent primates and birds. And indeed, we see chimps and crows learning to use tools by watching group members in action. More recently, social learning has been documented in a much wider range of species including insects, turtles, fishes and tadpoles. This should not be all together surprising, because natural selection should select for animals capable of rapidly acquiring essential information that will ultimately give them the edge over rivals. Martin and I teamed up with Richard Byrne from the University of St. Andrews in Scotland, to conduct the first test of social learning in a lizard which has recently been published the the Royal Society journal Biology Letters. We used our favourite lizard, the Eastern Water Skink (Eulamprus quoyii), since we have been working with them since 2010 and we have previously shown that they can learn quite rapidly. We used two groups of lizards based on their age: ‘old’ lizards that were about 5 years old and ‘young’ lizards that were 1.5-2 years. We began by training a group of demonstrators to solve a task that involved them having to flip a lid off a dish in order to acquire a nice juicy mealworm. We then randomly allocated lizards either to a social learning treatment where they would see a demonstrator conduct the task, or to a control, where they would see another lizard but without them doing the task. The lizards were separated from each other by a piece of see through plastic. 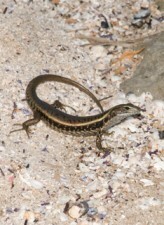 Both young and old lizards were put through two different tasks differing in their complexity. Check out the video at the bottom of the post to see a lizard in action! The results were somewhat surprising. Old lizards did not appear to use social information in any significant way and learnt to solve the tasks at much the same speed as the control group. Young lizards on the other hand, did pay attention to social information and learnt to solve the second task faster than both the control group, and old lizards. There may be several reasons for this interesting result. Young lizards may stand to benefit more than older lizards by paying attention to the life lessons of other lizards. Alternatively, they may also have more opportunity for social learning because adults are less tolerant of rivals and more likely to chase adults away than they would a juvenile. Lizards can now be added to the growing list of animals capable of social learning. Furthermore, they can also be added to the much smaller list of animals in which we know that social learning is age-dependent.